Welcome to Make It Monday with Kraft Outlet. Use this week's "Lucky Green" to inspire you to create your project and then link it up at the bottom of this post before 6:00 p.m. (Eastern Time) on Sunday March 17, 2013. Remember your projects MUST include the use of Kraft cardstock and/or items that can be purchased at Kraft Outlet! Also, all of our followers who participant in our challenges this month have a chance to be featured on our "Feature Me Fridays" posts as well as be entered to win a $15.00 Kraft Outlet Store Voucher! The more challenges you enter this month, the more chances you have to win! Jan made this card as a Random Act of Kindness for St. Paddy's Day. Inside is a lottery ticket for a stranger, delivered to them by a waitress, sworn to secrecy. Jan began with a Kraft Blank Note Card. She adhered some punched design paper, and a Bingo card, which is actually a Lost and Found Salvage Sticker. Atop that is a Schedule Card from the Identity Card Set, with Lucky U spelled out from the Hodgepodge Magpie Stickers and popped up. Natural Hemp cord is threaded through the shamrock buttons, and used as a bow on the bingo charm. This is truly a 10 minute card ! Stop by and say Hello, at Jan's blog, chai tea 'n me !! 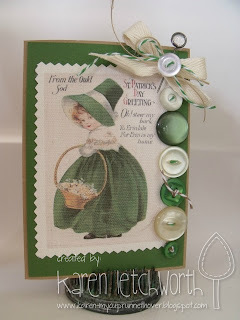 For today's "Lucky Green" challenge, designer Tammy, used the darling vintage image as her inspiration. She started by piecing together her patterned papers onto Lunch Bag Kraft Cardstock. She added a portion of a doily to the bottom half of the card face. She took a White Library Card and added a touch of vintage ink to the edges for a bit of a distressed look. She stamped the Good Luck sentiment from Paper Sweeties So Sweet of You set in the upper left corner. 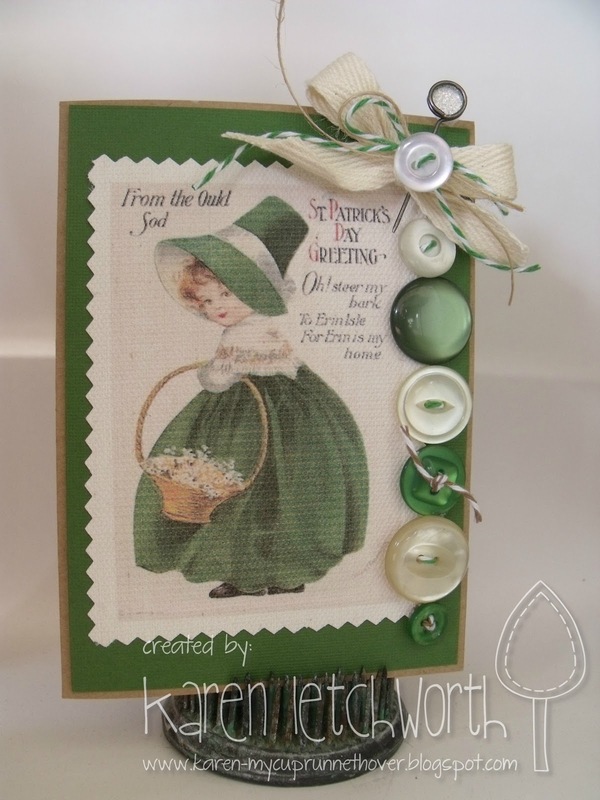 Next she added a die-cut shamrock just below the sentiment adding the vintage image over top of the White Library Card. She took a length of Natural Twill Tape and wrapped around the card front and tied off with a button and Natural Hemp Cord. A final finishing touch was a paper star border at the top which was created from Buff Ivory and green cardstock. Please visit Tammy's blog, Creating Somewhere Under The Sun, to view additional information for the card she created for today's challenge. For this week's challenge, Design Team Member, Karen Letchworth, started by going on the internet and finding a free vintage digital St. Patrick's Day image that she printed onto a piece of printer-ready canvas. Then, she took a Lunch Bag Kraft Notecard which is one of Karen's favorite "go-to" items from The Kraft Outlet and she attached a matching green cardstock base. Karen loves folding her cards using the awesome Bone Folder Tool. For the next step, Karen adhered the canvas image onto the green cardstock, which had been cut using pinking sheers. She attached several green and cream vintage buttons that are adorned with green and brown Baker's Twine, and then she made a bow using Natural Twill Tape, jute, and more Green Baker's Twine. Karen also wanted to implement Jan's Awesome Glitter Stick Pin Tutorial from last week - wasn't that cool? This was made using a Tim Holtz Memo Pin. Having you share your sweet creations in our weekly challenges is always a blessing to Karen, and she really hopes that you will pick up some new goodies at The Kraft Outlet and then stop by to play along with us. It's always exciting to see your creations. Please stop by Karen's blog, My Cup Runneth Over to get a closer look at her project. 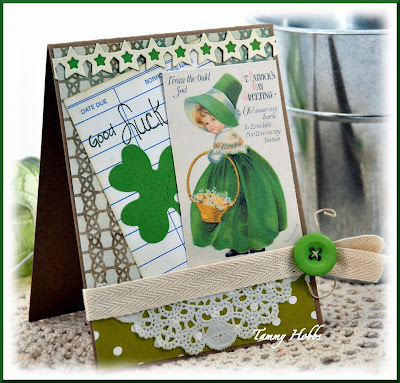 For today's 'Lucky Green' challenge, Debbie started with a base of white card stock onto which she layered a piece of green card stock and then a layer of Lunch Bag Kraft Card Stock -- rounding the corners with a punch first. A pretty white paper doilie was layered on top of the Kraft Card Stock and then a piece of Black Polka Dot Twill Ribbon was added. A bow was made from another piece of the Black Polka Dot Twill Ribbon using a snipett of Black Twill Tape to secure the bow in the middle. Debbie stamped a heart image from the Paper Sweeties Snow Friends stamp set four times, cut them out and adhered them to a Memo Pin to create a four-leaf clover. Deb created two leaves from Burlap and then made a bow with some Green Baker's Twine. A piece of Music Note Washi Tape was added to the bottom left corner of the card and last Debbie stamped a sentiment from the Paper Sweeties So Sweet of You stamp set to complete her card! Please visit Debbie's blog, Simple Treasures, to view additional pictures of today's project. unless closing a St pat challenge on St Pat Day is unlucky. Heehee. Wonderful DT St Pat Lucky Green creations. Figuring since theme is Lucky Green that if color green is there and not St. Patrick's Day then it is acceptable as well. Please let me know if this is true? Just green on your project is fine and the typo is now fixed... sorry everyone! Also... Top Three winners are chosen by the Design Team, monthly prize winners of the store voucher are randomly selected. Thanks for response on green color usage & on how the winners are selected. Thank you for another great challenge - Green! Have a wonderful week!